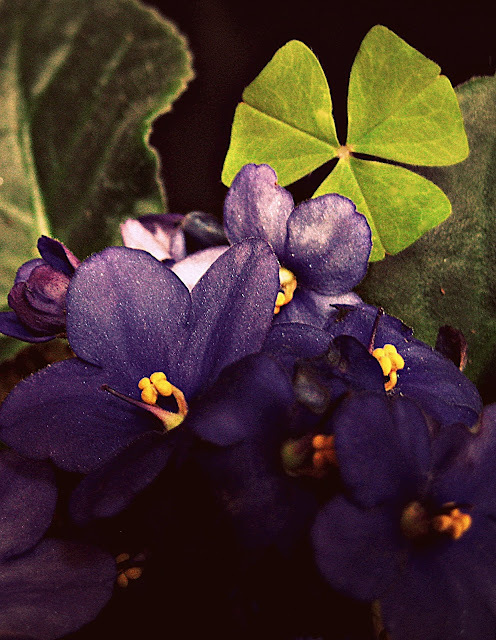 This lone shamrock showed up in my African violet this week, just in time for St. Patrick's. A shamrock bulb must have been hiding in the soil when I repotted! It is such a beautiful image that reminded me of a beautiful girl. It's rather dark, I'm afraid. Thats amazing Tess that you found the little shamrock in your African violets. How timely. Great Prompt Tess! I feel awful outing the violets for the shamrock but it is near the 17th! Somehow this image reminds me of a charming girl at my workplace who loves to wear this color. Come over my blog and enjoy my haiku! Shamrock only for me, I'm afraid, and rather irreverently at that. and Happy St Patricks Day everyone! i am in love. with the picture. all the purple, its just hypnotic. I had an idea, but the true poem disallowed it, forcing itself onto the page despite my best efforts! Great prompt, African violet remind me of my youth! Hi everyone, it's been about 6 months since I submitted any poetry to the site, but am sure happy to be back :) Hope you like my offering and here's to signs of spring. Thought of my transplanted Irish ancestors with this one. St P's Day was utterly subconscious! When I did this last evening, I wondered to myself 'why Ireland'? Co-incidence? . . . (Perhaps). . . It's a stretch, but the photo gave me my character's name. Even if I didn't get the flower right. Another 'quickie' this week. We've just lost our African Violet, after giving it years of tender loving care. It's sadly missed. Brilliant, timely photo - thanks willow! Thanks, Tess, for the lovely photo..inspirational! Mine's a slightly less sentimental...and hopefully humorous take. That is a beautiful photo! Ah, yes. A shamrock. Now I might be forced to celebrate. I just did a poem called Come Forth, Primavera, going not with the idea of a clover, but rather the whol idea of spring put together. Sorry that I had posted it up late. It'll be up on my twitter, too. This photo really speaks to my heart. Thank you, Tess. I was brought back to my inconvenient days. Tess, great photo. Easy inspiration to write this week. My quickest microfiction in the one-month history of my blog. Thanks. One day I must visit Tanzania to see the wild ones growing ... Thank you for the prompt. The pic is so very captivating! Beautiful photo. I thought it was a violet and a shamrock. I guessed right. Fun prompt. I totally ♥ this photograph! The colors are simply stunning. Thanks for the prompt. What an amazing photo, just in time for St. Paddy's Day! I didn't really go with the shamrock theme though. The violets were too captivating. Thanks for a great prompt! delightful prompt for the week. love those colors together. never have been able to grown african violets but my gram always had a half dozen in the dining room window. I think my Irish Great Grandmother might have liked this picture! The stalwart shamrock is stunning, but the violets cried out to me, too. just finished my poem. i'm relishing in all the beautiful comments here. Tess you've done it again. thanks to you and all the talented writers here! Violets hidden among the clover, nice! The colors in your photo are so vivid ~ alive! Shamrocks and violets - lovely bouquet. Thanks for the inspiration. A lovely photograph too! Loved the photo and the inspiration it provided too! Happy St Patrick's Day when it comes. Lovely photograph. I used the color, not the flower. I think it is unfinished and there will be a revision later today - but here it is for now. I guess I just can't get my mind turned away from the horrors across the globe from me. Not even such a positive and affirming photo could take me off topic. Yup, thanks for the prompt. Thank you for the lovely prompt, Tess!! Reading on this would be fun indeed! Lovely prompt - even if I have approached it somewhat obliquely. These beautiful purple flowers reminded me of the Holy Brother. Delighted to have found you. Nice prompt. My first time here. Hope to be a regular. Sorry, not very Irish of me. OMG, Tess, your photo provided the total essence of my life. Thank you! Completed my poem (if you can call it so). I took the color as an inspiration. Please check out at www.periwinkler.wordpress.com! I have always found the Magpie writers to be a source of support and encouragement. It is my opinion that unkind comments do not belong in a forum such as this.